I agree with you over Brexit. Though I dont think it will finish the NHS. No one is going to stop you drinking as much as you like. The unit system is for information for those people, like me, who are concerned about how much they drink. You may not care about your health but many people do. South African wine must have a warning statement, text size and contrast with background are defined. There are six different warnings that wineries can choose from. And yes, there are not pavements outside town centres in Swartland or the rest of the winelands. But you’ll rarely see a white person walking along country roads, and those that of necessity must walk on the roads are unlikely to buy bottled wine, and certain not to be able to afford to buy Badenhorsts. So the warning is a sort of joke in that it doesn’t apply to people who buy the wine. *the roads have a centre line and then a yellow line at the roads edge. In most roads outside towns there is a wide strip of road surface between the yellow line and the edge of the tarmac. This is used by cyclists and walkers. But… it’s a dangerous place, because slow moving vehicle move over the yellow line to let faster vehicle pass. If the vehicle can’t pull back over the yellow line in time or don’t see someone on the verge then they’re dead. USA ones have huge importer labels. These are stuck over the US Surgeon Generals warning as that is not legal on UK bottles. They also show the abv , bottle size and lot number to comply with EU/UK law. Interesting about health risks and treatment cost. It easy to point at smokers and maybe drinkers, but there’s plenty of lifestyle issues, exercise, diet, fast food and environmental risks, like asbestos and even diesel fumes. All of which could be mitigated by the patient or wide society. I’m guessing that the National Health insurance need to take the rough with the smooth. Somebody i know went for a hip/knee op, boosting he was using the best private surgeon in the western world or some such. He was refused until he lost weight and quit smoking. They didn’t think he’d make it through otherwise. Yes but someone might share there bottle with some one else over two nights and then purchase other drinks in a pub. 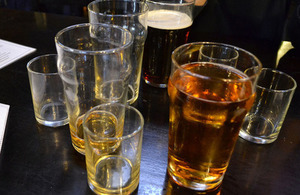 Updated alcohol consumption guidelines give new advice on limits for men and pregnant women. This new guidance has been based on a wide range of new evidence from this country and overseas. We have reviewed all the evidence thoroughly and our guidance is firmly based on the science, but we also considered what is likely to be acceptable as a low risk level of drinking and the need to have a clear message. The CoC’s latest findings support the significant links from alcohol to cancer outlined in the new guidance. I’m sorry but, coming from a scientific background, I hate wooly reports like that and consider them almost meaningless. They may well have foundation in facts but they don’t give the facts. They are filled with wooly adjectives like high or low, increased or reduced that tell you absolutely nothing. The only time they give actual figures is when telling you what amounts you should drink but not when telling you consequences. Is my risk of these cancers going from 1% to 1.01% or maybe from 1% to 10%? The difference between those two is enormous but I am not provided with even a hint of what the increase really is. So how can I make meaningful decisions based on it? Broadcaster Adrian Chiles has got us all clutching our livers in alarm (if we can find them: Chiles thought his was in his back) thanks to his confessional BBC documentary Drinkers Like Me, which details his longstanding reliance on alcohol. Chiles admits candidly that he drinks anything up to 100 units of alcohol a week, whereas the recommended level in the UK for both men and women is 14, a unit being 8g of pure alcohol, that’s to say a shot of whisky, a third of a pint of beer or half a 175ml glass of red wine. Just for your info – make of it what you will – in New Zealand the recommended limit for men is 19 units per week; in Ireland and Denmark it’s 21 and in Spain it’s 35. The UK government states further that “there is no level of regular drinking that can be considered as completely safe”. Presumably just as there is no level of regular driving, flying or even walking downstairs that can be considered as completely safe. Just saying. Sadly, as drinks editor of The Spectator and author of several books on drink I float in the same boat as Mr Chiles: last week I clocked up 110 units. I don’t drink during the day except for the very occasional shirt-popping lunch and don’t open anything before 7pm. But as the clock strikes so out comes the vino and it’s a rare evening that I drink less than a bottle or bottle and a half, be it out on the town or at home. You know the form: a glass of chilled fino sherry or NZ Sauvignon Blanc as you wind down after work; another whilst you catch up with the rest of the family and ponder what’s for supper; a glass of Mâcon Lugny whilst you’re cooking; a hearty glass of red Bordeaux with the beef stir-fry and another whilst you clear up; a glass of sweet Muscat with a snicket of cheese and finally just a tiny measure of armagnac as you settle down on the sofa. I’m not proud of this in the slightest, in fact I’m more than a little alarmed now that I detail it. I’m just telling it as it is. Once I’ve started I simply cannot stop. I don’t want to give up (if I did, I would be out of a job, although somehow I manage each January on the water wagon); I do, though, want to cut down dramatically as I’m fully aware that such ridiculous consumption is unsustainable. One obstacle is that almost all my friends, neighbours and wine trade contemporaries drink (or used to drink) just as much as I do and among them such consumption is not regarded as abnormal. The other obstacle is that I’m awash with alcohol at home. Being a simple hack, I might be cash poor but I’m also wine rich, receiving several cases of wine a week from drinks PRs, supermarkets, producers, agents and importers, not to mention the many wines I get sent to taste for the Spectator Wine Club. And, having just finished writing a book on spirits and liqueurs, I’m currently surrounded by 221 bottles of vodka, gin, cognac, armagnac, tequila, whisky, absinthe, mescal and so on. Temptation is all around me. If I didn’t write about wine and spirits I wouldn’t drink so much of them but then I wouldn’t write about them if I didn’t like drinking them so much. Oh and the third obstacle is that I’m spectacularly weak-willed. Sigh. Alcohol is a drug, we all know that. Indeed, when I interviewed a celebrated mixologist recently he pointed out that he was little more than a licensed drug dealer, selling a controlled substance with the express intent of getting folk slightly tipsy or, indeed, pretty much blotto. And that’s the thing, I don’t care what you say or how you dress it up, whether you are the cider-swilling tramp on the park bench or the vintage claret-loving connoisseur in the swanky restaurant, we all drink for the same reason: to get intoxicated to whatever degree. If we didn’t like that slightly (or very) squiffy feeling, we simply wouldn’t do it. I am sure you are quite right to keep an eye on your alcohol intake, @BENEDICTNASH. Nevertheless, I’m with @MikeFranklin on this - it’s distinctly a weaselly press release. One minute it is discussing cancer risk (no known zero-risk lower limit), the next minute it has seamlessly moved to overall health risks. But the latter involve many other risks, including the risks of having no alcohol at all (not a zero-risk option itself). Then it moves to risks to women in a less than clear way. First let me say that if you are pregnant or think you might become pregnant, the only safe alcohol intake is zero. But beyond that, you need to be clear what you are talking about. Is the risk of contracting x offset by the benefits of y? After all, if you look at something like life expectancy, that may be expected to offer some sort of integrative overview of the effects of alcohol, whether positive or negative. Anyway, I am inherently distrustful of statements that start with specifics and then move seamlessly from there to make generalisations. (This is taken from Wood AM, Kaptoge S, Butterworth AS, et al. Risk thresholds for alcohol consumption: combined analysis of individual-participant data for 599 912 current drinkers in 83 prospective studies. Lancet 2018; 391: 1513–23.) It is the huge meta-study that a lot of these government comments are referencing. However, it is buried away in a technical appendix. The whole thing is online should you be brave enough to tackle it. Thank god someone has referenced an actual type 1A evidence meta analysis, my years in The pharmaceutical industry has taught me many things but most importantly not to believe anything that can’t consistently show statistical evidence . You also can’t compare study to study unless the criteria for inclusion is exactly the same . "In South Africa, we’ve got what the government calls “7 Health Warning Signs.” It’s recommended health warning slogans, and we as a company have the option to select any one of the 7 if we would like to put it on our product. Why we have decided “Don’t Drink and Walk on the Road, You May Be Killed” is very simple. In our consumer base, it’s more the rural area — and so many of them don’t drive motor vehicles by themselves. Where i live in the countryside in West Yorkshire. Most road away from residential areas dont have pavements. if I remember correctly you are much more likely to find “units” on supermarket wine where the wine is actually produced (blended / packed) for the supermarket (M&S, Tesco, Aldi etc.) and less likely on wines purchased in as a finished item. Very true. Particularly as many may have been bottled in the UK.